I baked up these buns as a special treat for Grant’s birthday brunch, and seriously, they were epic. Pillowy, tender, studded with crunchy toasted almonds, and perfumed with the essence of our heavenly freshly-harvested honey. They have just the right amount of richness without overdoing the butter, and like any sensible breakfast bun recipe, they’re designed to hang out in the fridge for a slow overnight rise after being shaped the day before, so they’re ready to sleepily toss into the oven while you start brewing a pot of your best coffee – special weekend treat-yo-self baking at its best. Baking with yeast has a reputation for being difficult, but it doesn’t have to be. I’ve always loved baking bread and have experimented with a lot of different techniques, but most often I like to keep things simple – a la Artisan Bread in 5 Minutes a Day. If you’re not familiar with this book, it presents an efficient and reliable method for crafting large batches of no-knead dough, which are designed to rise slowly in the refrigerator, steadily developing flavor as they wait for you to pull out hunks to bake off for a fresh loaf whenever the mood strikes. Yes, it is exactly as life-changing as it sounds. I had been taking a break from this method since I started tending a sourdough starter (which you can read about here and here and here! ), but I’ve now been happy to find that the two baking habits are quite compatible. This ABin5 blog post describes a traditional conversion for incorporating sourdough into recipes using commercial yeast, but I was drawn to an even easier approach suggested by a commenter: simply adding 8 oz. of starter per full-sized batch, without changing anything else. Props, Brenda! It worked for me, and I ventured to cut back a little on the powdered yeast too. Once I have the chance to practice more, I’m looking forward to seeing just how much I can rely on the starter for a legit sourdough rise. These buns marked my first foray into the book’s chapter on enriched doughs. Originally I was planning to modify a lighter version of the brioche formula, but when I noticed that the challah recipe was already right in line with what I was scheming, it was a no-brainer to use it as the base for these breakfast buns. From there, I still had to meddle by swapping in some whole grains. 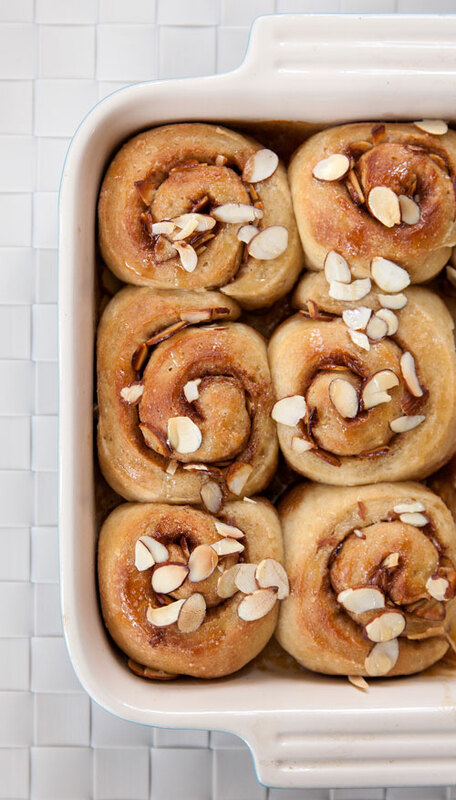 Not 100% – I learned that lesson the last time I made sticky buns – but I was able to cut the white flour 50/50 with whole wheat pastry flour for a little grainy goodness without the dough losing its structure, so I call that a win. For simplicity’s sake, in the recipe below, I’ve scaled the ingredients down to yield just a single perfect batch of breakfast buns – but if you’re going to take the time to make dough, it’s worth your while to scale up to a bigger batch like the book recommends. Even if you’re not planning on baking again soon, you can portion out doughballs to wrap up and keep in the freezer for long-term storage. Which reminds me, I’d better wrap this up… I have something I need to go thaw out! Dough recipe adapted from Artisan Bread in Five Minutes a Day. Combine the water, yeast, sourdough starter, salt, egg, honey and melted butter in a large bowl. Add the flours and mix, without kneading, until smooth. 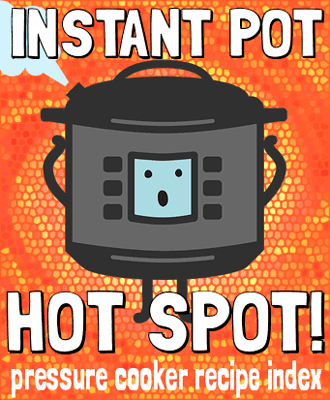 Cover the bowl loosely with plastic wrap or a damp kitchen towel, and allow it to rise at room temperature for approximately 2 hours. The dough can be carefully shaped at this point, or chilled for later use, which will make it easier to handle. The dough can be refrigerated for up to 5 days, or even frozen for up to 4 weeks (if freezing, defrost overnight in the refrigerator before using). The day before you plan to bake, dust the dough with a sprinkle of all-purpose flour and use your hands to shape it into a ball, creating gentle surface tension by stretching each of the four sides of the dough down to the bottom of the ball (you can learn more about this technique in the ABin5 book). Dust a work surface lightly with flour, and roll out the dough into a rectangle approximately 1/2-inch thick. If the dough seems too stiff or elastic to cooperate, let it rest for 5 minutes and try again. In a small bowl, mix the honey, softened butter, cinnamon and salt. Spread this mixture evenly over the slab of dough, then sprinkle 1/4 cup of sliced almonds on top. Starting with a long side of the rectangle, tightly roll the dough into a log. Slice the log into 9 equal buns using dental floss or a sharp knife. Lightly coat a 8" square baking pan with butter or oil, and arrange the 9 buns into a square grid, leaving space in between buns to allow room to rise. Cover the pan with plastic wrap and refrigerate overnight. Alternately, if you prefer to bake right away, allow them to rise at room temperature for at least 30 more minutes before baking. 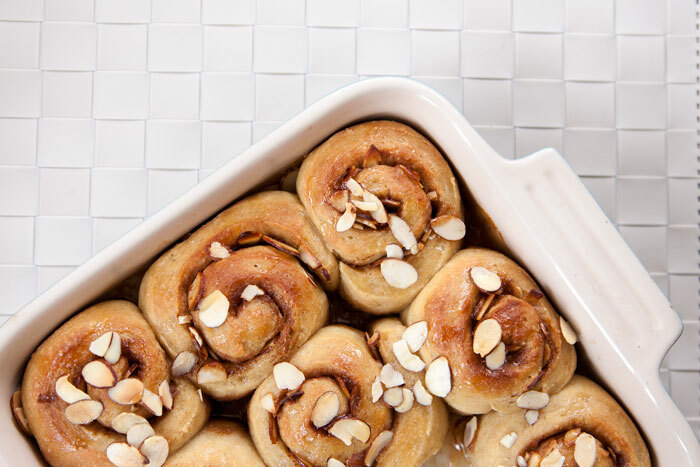 When you're ready to bake, preheat the oven to 350 F. If your buns have chilled overnight, take them out and allow them to rest at room temperature while the oven preheats. 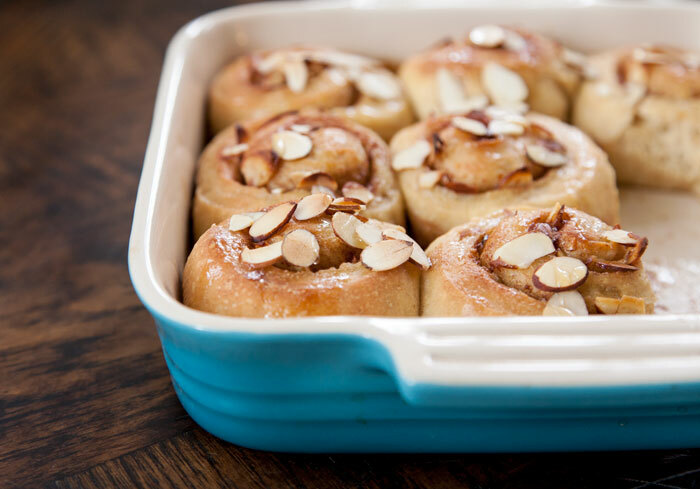 Top the buns with 2 tablespoons of sliced almonds and bake for about 25-30 minutes, until puffed and golden brown. If you would like to top the buns with a honey glaze, whisk together the powdered sugar, honey and milk in a small bowl. Drizzle the mixture evenly over the buns immediately before serving. Pure raw honey, drizzled alone, is another option for an indulgent sticky-sweet topping.